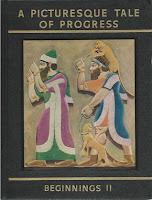 This second volume of A Picturesque Tale of Progress begins with Babylonia and the Assyrian Empire. 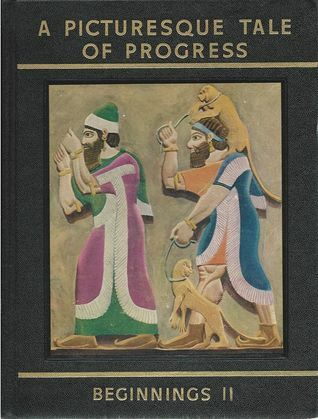 After discussing these civilizations and comparing them a bit to Egypt, the book moves on to Biblical history, covering the Old Testament from the time of Abraham to the fall of Jerusalem to the Babylonians. I have to admit to being less enamored of this set of books after reading this second volume. When I started Beginnings I last month, I felt that I had discovered the only books I would ever need to teach history. I see now that this was not only not true, but probably a foolish thing to expect from any one resource. The big problems I had reading this volume were related to the sheer number of names introduced by the text and what I felt was an inconsistency in the overall quality of writing. As far as the number of historical figures goes, it is clear to me that I'm going to need to supplement my own reading in the area of ancient history in order to figure out where to focus my kids' attention. This book mentions a lot of people, and it felt pretty impossible to keep track of them all without needing to look them up in other books and/or keep copious notes about each one. I kept having to stop to Google this or that name, and that would only lead to the discovery that what is told in Beginnings II is only the tip of the iceberg about that individual. It began to feel like I was drowning in information, and I could feel my brain just shutting down as it would when I read history texts in school. It was as though my mind was saying, "I'll never grasp all of this, so I'll just shut it all out." In terms of the writing, it sometimes feels very engaging to me, but at many other points, it feels lifeless and no more interesting than the boring textbooks I was assigned as a kid. I thought the stories from the Bible were the highlight of the book, in part because they were familiar and I didn't feel lost, but also because of the author's point of view on Biblical history. At every point, events taken from the Bible are given equal weight to those events recorded in other sources. The author also does not negate the supernatural elements of these stories. When individuals were inspired to act by God, she says so, without qualifying these statements or trying to attribute those individuals' actions to other, more "plausible" explanations. This is, of course, not how these events would have been treated in a public school textbook, so in that sense, this set of books still feels like a gift to a Catholic homeschooler who plans to teach religion and history side-by-side. I may take a little break before starting on Explorers I, which is the third book of the series. I have decided to make it a point to read the entire set, but after this book, I need to cleanse my palate a bit before jumping back in.